Actual photos from our high-quality (while still great value-for-money) central London hostel. Our guests appreciate the cleanliness and quality of our hostel. We believe the quality of your accommodation is what sets us apart for you. We also have another page with photos our guests shot at the hostel. Our communal lounge area is a great place to meet new friends from all over the World. Our breakfast and evening dining area is a great place to meet and chat with other travellers. A view of our twin-bunk-bed rooms. Our chill-out area with a 65" TV satisfies the best of movie-buffs - and we have 100s of movies available + live TV and Sky Sports. A great view of the front of the building at our London hostel. Our dining room is stylish, like everything else here, and is a great place to start a conversation with fellow travellers. 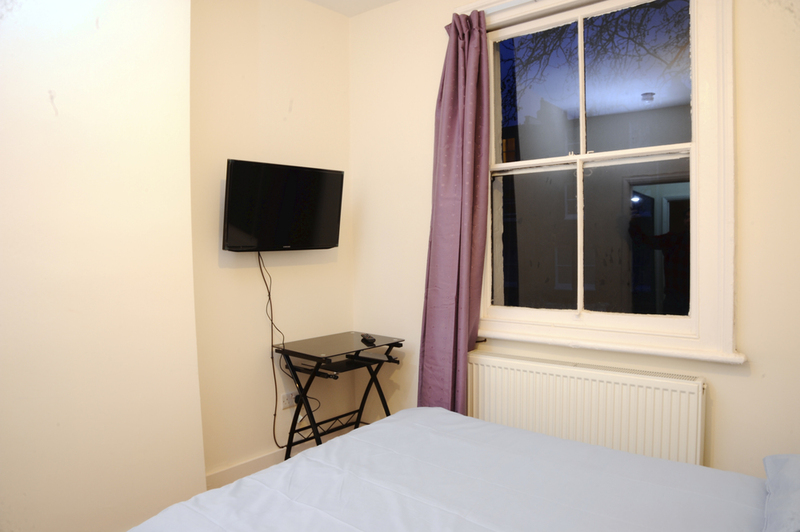 Enjoy a TV of your own and great comfort on a budget in your double-bed en-suite room. Our shared Internet computer in the lounge. Our shared community kitchen where we have a shared fridge-freezer and all the cooking amenities you would need. This place smells so great every night! Our garden, which now features a trampoline for kids and outdoor tables for socialising is a great place to chill out on a warm summer's evening or simply have a smoke in solitude. 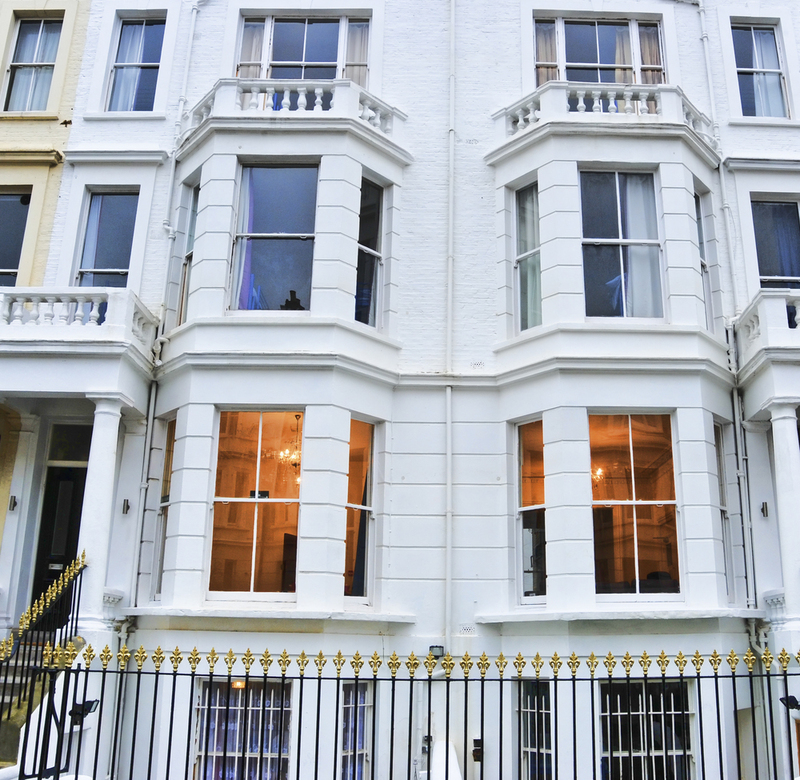 The view of our hostel when you are approaching it by foot coming from Earls Court tube station. It doesn't look like breakfast just yet, but when you wake up it will from 7-10am. 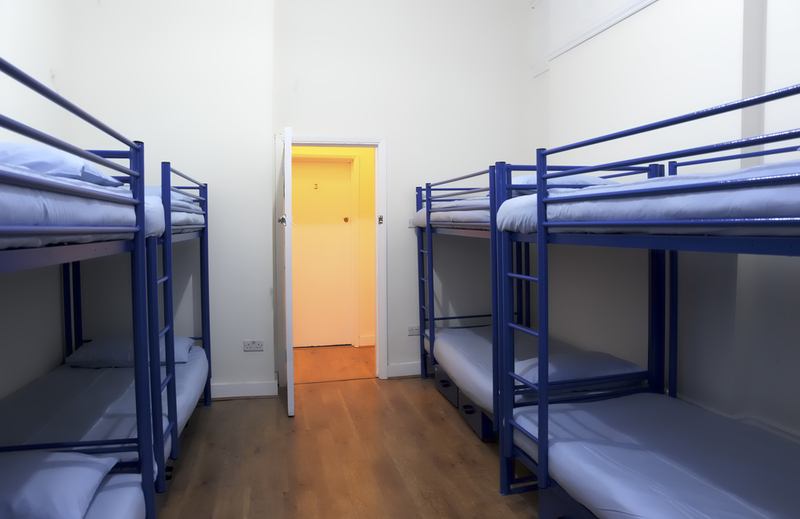 Our rooms are amongst the cleanest rooms you will find in any London hostel. If you book one of our en-suite rooms you will enjoy a clean, functional and stylish bathroom. No other hotel or hostel in London will give you the value for money we offer - like for example on this double-bed room! Our facilities are as clean as we can keep them possibly - with 4 cleaning runs a day, to make sure you enjoy every aspect of you stay. Our triple-bunk-beds are the most cost/space efficient way rooms for groups travelling together. We pride ourselves in our styled exterior and interior appearance as a high-end hostel. Our large hostel rooms with 8 beds are clean and tidy. Each bed has it's own locker. Another view of one of our our eight bed hostel rooms. Our shower-rooms have temperature control and great water pressure and control. Our en-suite double bedroom features spacious storage and luggage/clothing areas.